Consent for a stunning 4,300 square foot (GEA) house in a 21 acre rural setting. Stylish, split level design, positioned to nestle unobtrusively into the surroundings. Far reaching views on the edge of the South Downs National Park Positioned adjacent to Alice Holt Forest Excellent equestrian facilities including Ascot stable yard with 6 stables, hay store & tack room. Full competition arena & second floodlit all-weather menage.Detailed architectural drawings are available, enabling the project to start immediately. This modern and stylish split level design has become more fashionable and sought after as architecture has become more global and ideas have swapped continents. Influences for modern design comes from all over the world with Sweden, New Zealand, Canada, Austria, Germany, France and Switzerland leading the way. Design can be about material choices, build techniques, thermal efficiency and not being constrained by an existing building. Huff who lead the way have been challenged by firms like Baufritz and can incorporate cutting edge technology like Tesla Powerwall. Open plan living, mainly on one floor, is an increasingly sought after lifestyle approach, which is already popular in Australasia, Canada and the U.S. The choice to embrace this is yours and there are plenty of professionals out there who can help you realise the build.Getting to the point of a consented site has taken five years and the owners have decided to hand over the baton. The consent was around their needs and the space could easily be re-configured to provide up to 4 bedrooms on one level. Alternatively, the lower ground area could potentially be extended to match the floor area above and create additional storage space, gym, cinema or games room.Planning permission has been granted to build a contemporary family house of approximately 400 square metres GEA (4305 square feet), which has been designed to suit the current owners and their particular requirements, and to take advantage of the outlook and orientation. 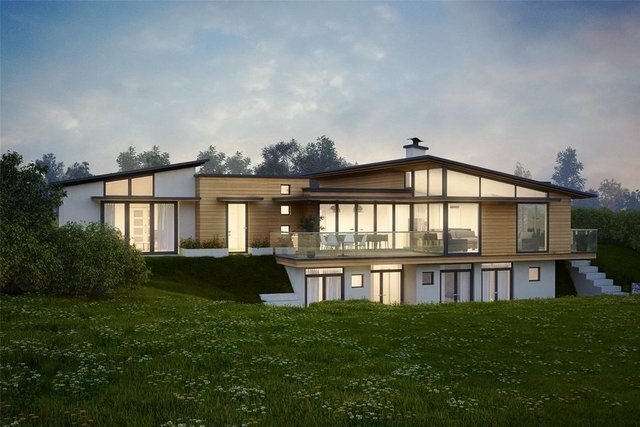 There is a great deal of flexibility within the design which would enable the layout of this contemporary property to be adapted to suit your own requirements. It is vital to note that the CGI images are a representation of a slightly earlier set of plans. The site at Reeds Hatch Farm is approached via a five bar wooden gate. The equestrian facilities are directly ahead, with its own access road, with the building plot to the right.The competition size sand school, together with a newly built range of Ascot stables and second all weather floodlit school, provide fantastic equestrian facilities. The paddocks are well fenced and easily accessed. The land is bordered on two sides by country lanes and natural streams on two sides. The land is mostly level, gently sloping towards West End Lane on the north side of the plot.